Eat a well-balanced diet from 5 food Groups: Carbohydrates, Vegetables, Fruits, Protein & Dairy products. 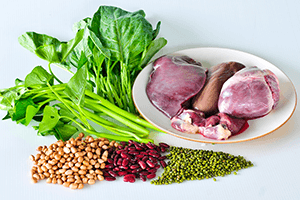 Iron-rich foods are highly recommended because Iron deficiency is a common problem after delivery. These foods include: Liver, lean meats, poultry, oysters, tuna, salmon, molasses, dried beans and prunes, broccoli, beets, spinach, eggs, legumes, almonds, raisins and apricots. Both mother and baby benefit from being in contact immediately after birth. Give your baby your full attention during this precious time. Gaze at his face and let him hear the voices of his parents that he has already learned to recognize in the womb. Lay your baby on your chest, tummy to tummy, cheek to breast, skin to skin. Cover your baby with a blanket, and your body heat will keep him warm better than any elaborate hospital equipment. After holding your baby close to you after birth, let him breastfeed right away. Place your baby in a face-to-face position, adjusting your head and your baby’s head so that your eyes meet. Enjoy this visual connection during the brief period of quiet alertness after birth. 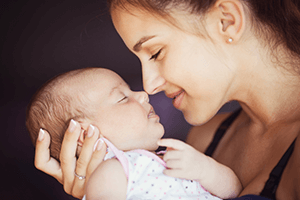 Remember to talk to your new born during the first hours and days after birth; a natural baby-talk dialogue will develop a bond between mother and baby. Voice-analysis studies have shown a unique rhythm and comforting cadence to mother’s voice.